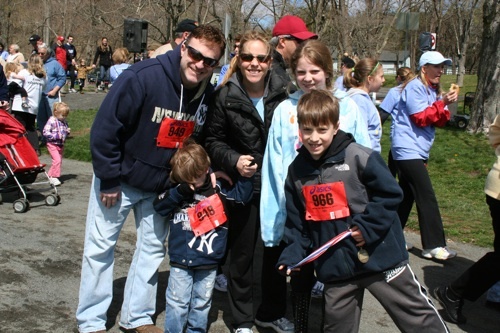 Team Schapiro at Miles for Matheny 2011. With about 45 days to go before Miles for Matheny, three fundraising teams were pacing the field. As of March 8, the top spot belonged to That’s How Scott Rolls, a team formed by Andrew and Julie Gordon of New Providence, NJ, whose 12-year-old son, Scott, is a student in the Matheny School. That’s How Scott Rolls had raised $2,048. Second place belonged to Team Schapiro, which had generated $1,275 in contributions, followed closely by Jack’s Team with $1,015. Team Schapiro was formed by the Schapiro family of Basking Ridge, NJ, and Jack’s Team members are Doug, Katie, Meghan and Caroline Harter of Madison, NJ, parents and sisters of five-year-old Matheny student Jack Harter. To start your own team, log onto www.milesformatheny.org and look for Team Fundraising Tips. If you need further help, email Patricia Cats at pcats@matheny.org or call her at (908) 234-0011, ext. 260. All funds raised at Miles for Matheny will help support the Matheny Center of Medicine and Dentistry, which provides medical, dental and therapy care to Matheny inpatients and people with disabilities in the community. This entry was posted in Uncategorized and tagged Jack's Team, Matheny Center of Medicine and Dentistry, Miles for Matheny, Team Schapiro, That's How Scott Rolls. Bookmark the permalink.